TAU’s Fourth UK Legacy Mission has once again been a resounding success, with its 22 participants enjoying an action-packed week of activities, including access to exclusive sites and an exciting day at Tel Aviv University meeting cutting-edge researchers. 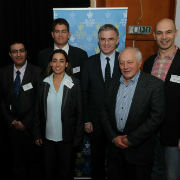 First launched in 2011, the UK Mission, led by Mr. Geoffrey Simmonds of London, a TAU Governor, has become a staple of UK-Israel philanthropy and has expanded TAU’s circle of friends and supporters in the UK, as well strengthened the bonds between Israel and British Jewry. 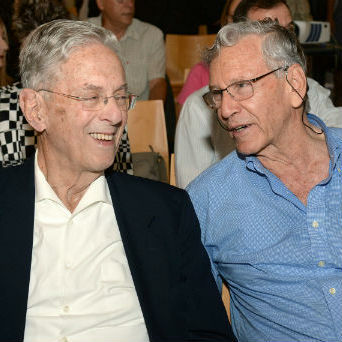 In return for committing to a bequest to TAU in their will, participants enjoy a week-long trip to Israel offering access to otherwise off-limits sites. Among the highlights of the week were a tour of the Hula Lake Park, one of the world’s most prominent bird-watching sites, guided by TAU’s Prof. Yossi Leshem, an authority on migrating birds; a visit to the Haifa naval base with Admiral Abraham Ben Shoshan, including a tour of a battleship and a dialogue with young naval cadets; an audience with Deputy British Ambassador Rob Dixon, who spoke of the special ties between the UK and Israel; and popular science lectures by some of TAU’s most innovative scientists, in the areas of cyber security, immunology, Middle Eastern studies, neurodegenerative diseases, music studies, materials science and engineering and physical therapy. The day at TAU began with a special ceremony at the Cymbalista Heritage Center at which each recipient movingly spoke about the loved ones they were memorializing through their bequest as well as their dedication to Israel. Each participant received a certificate of recognition from the University. The ceremony was followed by the unveiling of the 2014 Legacy Honour Wall, where participants’ names are displayed in perpetuity at a location in the heart of the campus. The day at the University included a tour of TAU’s iconic new Porter School of Environmental Studies Building and the building site for the Steinhardt Museum of Natural History, after which an additional ceremony was held in honor of Terry Clarke for her generous support of cancer research at the Sackler Faculty of Medicine, which will nurture the next generation of cancer researchers and physicians. Ms. Clarke said that the trip was exciting and fascinating and also very emotional in her case. "I am very pleased I have had the opportunity to honor my parents with my legacy," she said. The mission included a range of cultural experiences, including an opera evening with TAU’s Buchmann-Mehta School of Music to honor the generous support of Deborah and Colin Pulvernis to the Buchmann-Mehta School of Music, which will support talented music students. The mission ended its visit in Israel with a festive dinner in the company of TAU International students, as well as a reserve combat soldier who gave a stirring personal account of his experiences during Operation Protective Edge in Gaza this summer.